1. Add the milk, rice, and sugar in a heavy pot and bring to a simmer over medium heat, stirring occasionally with a wooden spoon to separate the grains. Add the cinnamon stick and vanilla bean, cover and simmer over very low heat for 30 minutes or more, until the rice is tender and has absorbed the milk. Do not stir the rice during this part of cooking. 2. Add the saffron and cook 1 min more, stirring with a wooden spoon to separate the rich golden color of the saffron. 3. 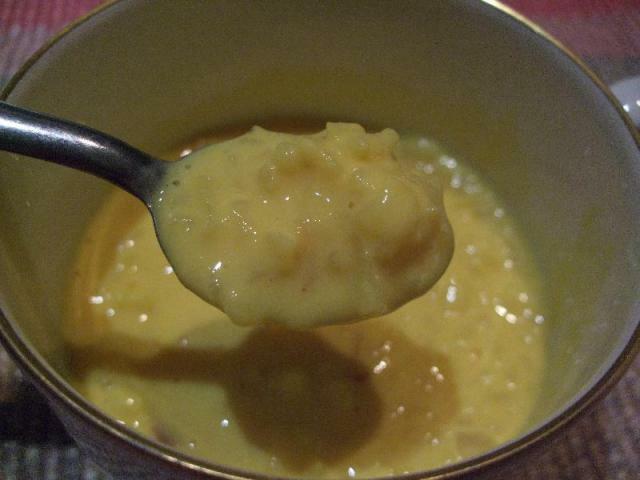 Discard the cinnamon and vanilla, pour the rice pudding (rijstpap) into soup plates. Cool at room temperature. (You may also place in the fridge to cool faster.) Sprinkle with brown sugar before serving.